Sauce: In a food processor or strong blender, puree the garlic. Add the parsley and finely chop. Add the oil, vinegar, water or broth, and seasonings. Process until blended. Taste and adjust the seasoning if needed. Should be flavorful and spicy, and should taste good as is. In a small bowl, combine marinade ingredients and stir. Put chicken breasts in a zip lock bag and pour in marinade. Turn until coated evenly. Refrigerate for 30 min to 4 hours. Preheat grill to medium. Grill the chicken for 8-10 on one side and 6-8 minutes on the other. Place on a platter and serve the remaining sauce on the side. Goes well with greens (broccoli rabe, kale, mustard greens, etc.) mashed potatoes, or rice. Easy to grill and really tasty! Make sure to spoon on plenty of extra chimichurri sauce! This is a beautifully blended mixture of seasonings, along with the balsamic vinegar and Chimichurri. 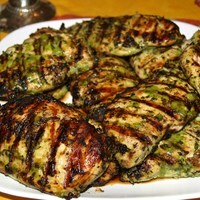 It would be really good off the grill for a summer dinner, or even done indoors in a broiler or inside grill all year. Good recipe! Thank you for sharing. This looks nice. Another good chicken recipe.